‘All The Things You Are’ is one of the most popular jazz standards of all time. It has been recorded by many different jazz musicians and so it’s definitely worth listening to as many versions as you can to get some creative ideas and inspiration. Check out the Wikipedia page on ‘All The Things You Are’ where you can find a huge list of jazz musicians who have recorded the tune. This would be a good starting point to find a few versions you like so that you can incorporate their ideas into your arrangement. 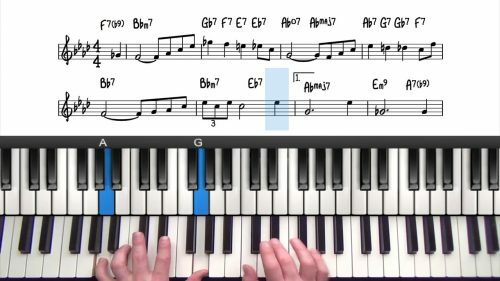 Originally written in the key of Ab Major, the tune actually starts in F Minor and then modulates through C Major, G Major and E Major before returning back to the key of F Minor in the final section. We’re going to start off with some 2 handed chord voicings and work through the whole tune at a slow-medium tempo. The second time through we will add more of an upbeat swing tempo and introduce some rhythmic elements to bring the tune to life. 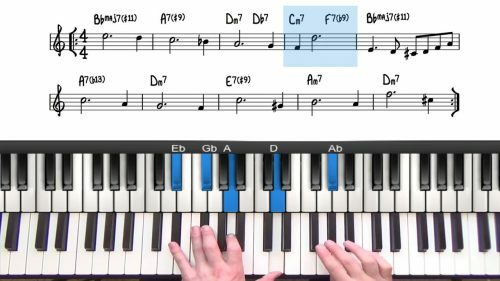 In this lesson we also explore some new applications of quartal harmony and a number of different passing chords to achieve a sense of forward motion throughout the form.